I was walking and felt a pop/crack in the ball of my foot in line with my big toe. Like when you crack your knuckles, I then felt pain in the tendon/ligament just where teh ball of my foot starts into the arch. Now when I pull my big toe back it hurts. What happened and how long to heal. I was not even running, I had just finished a 2 mile light run 7:30 minute mile, nothing strenuous. It is almost a week, getting better but still a little sore when I press the area. 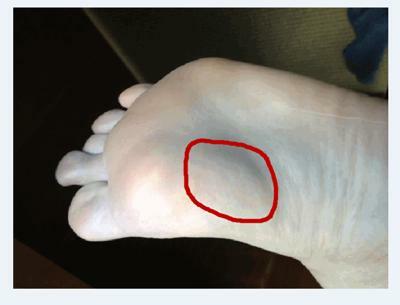 The most common cause of pain in the area of the foot that your photo describes would be a sesamoiditis. Located in that area of the foot are two bones about the size of jelly beans. These two bones are actually located in the tendons that allow your big toe to bend downward. So, they act as a lever system. That is why when you state you bend your toe, you feel the pain. The problem here is that for many people the sesamoid bones lie very close to the first metatarsal head and therefore are subject to the pressures of walking since they are so close to the surface of the skin. sesamoid bones and the sesamoid bones to the first metatarsal bone. You mention that your foot is feeling better, although not completely healed, which is a good sign since a sesamoiditis for many individuals can be very difficult to get rid of, since every time you take a step you are again straining those two small bones. You can read my section on sesamoiditis for a more in depth discussion, but let me emphasize that this is not a condition that you want to allow to get out of hand, as it can be very difficult to remedy. Most cases of sesamoiditis that tends to worsen will require a custom orthotic which by design is built to take pressure off of those two bones. Sesamoiditis is the most common cause of pain in that area but another potential problem comes to mind and that would be a partial tear of the plantarfascial ligament where it attaches into the ball of the foot. Even though this is not classic plantarfasciitis, which as a runner, you may have heard of, the possibility exists that there is a tear at the end of the ligament. If the area is continuing to improve than it sounds like you will do alright, but you need to be careful about re-injuring it by running because as I stated earlier, if it gets worse it will become a real issue for you. If you have concerns why not see a foot specialist in your area? thanks for the info. The pain is subsiding, still al little sore I have stayed away from running or heavy foot work for 10 days. I can pull my toe back and forth without any pain or discomfort. If I pres on the ligament it is sore but bearable. I am able to walk around barefoot not issues or pain or soreness. Rather than recommend any inserts for you I think it is important that you get an accurate diagnosis first, so that would mean seeing a local doctor. An insert for sesamoiditis would be different than one for plantarfasciitis.